I went into Gloucester City Museum the other day in search of a loo (like you do) and stopped to have a quick peek at the exhibits. 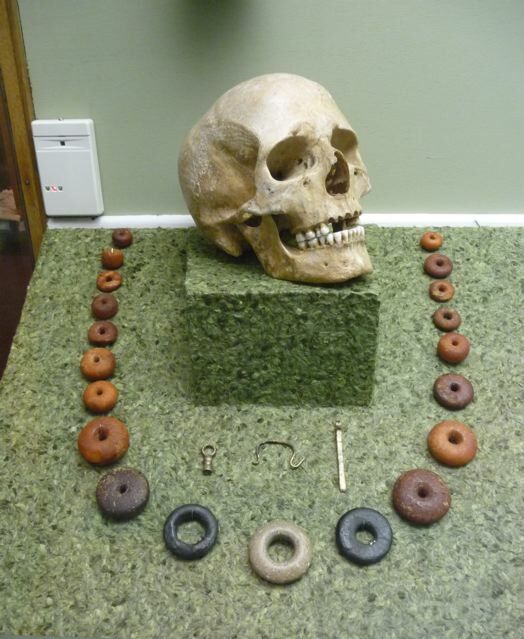 I liked this skull framed with an extraordinary collection of amber and Dorset shale beads. The central bead is of pyrophillite which came from the Baltic as did the amber. 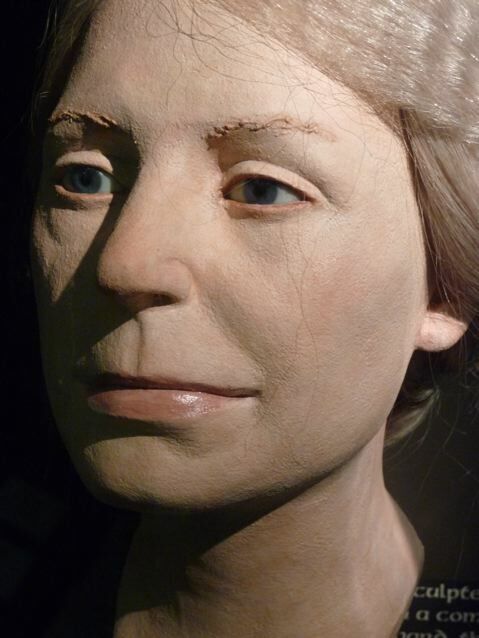 The head below is a reconstruction of the skull. 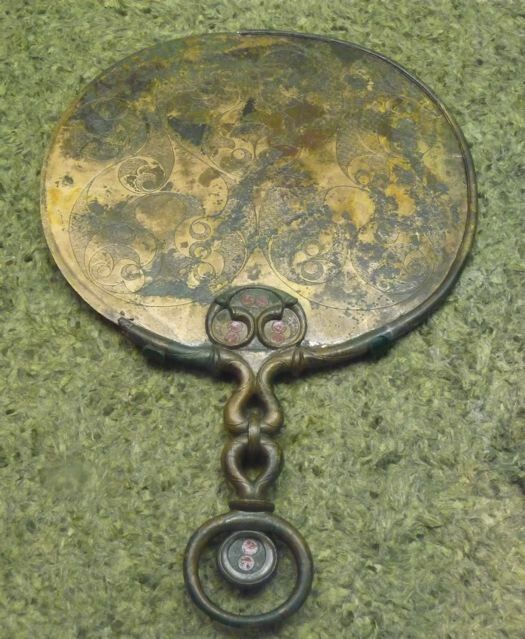 The Birdlip Mirror is one of the most important discoveries from Iron Age Britain, discovered alongside a rich selection of exotic goods and human remains. 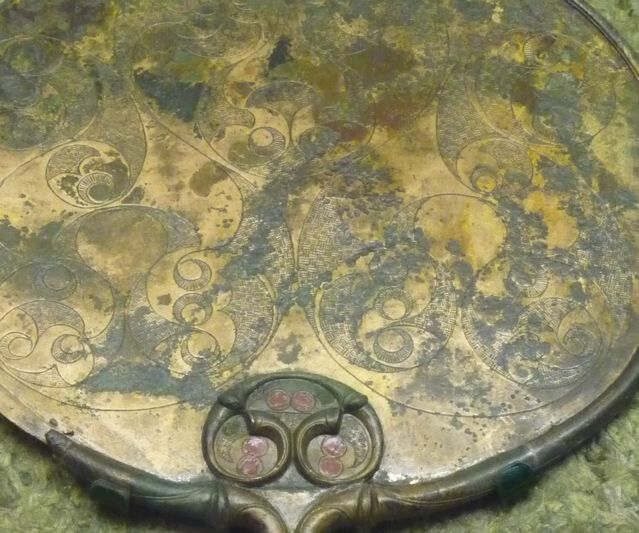 This exquisite mirror may have belonged to a priest, an aristocrat, king or queen 2,000 years ago. All I wanted was a trip to the loo and I ended up contemplating my mortality. So it goes. Lovely museum and lovely staff! I have promised the lady who is on duty on Tuesdays and Thursdays a loaf of seeded bread next time I am there. This entry was posted in Blogging and tagged birdlip mirror, gloucester city museum, memento mori on 10/05/2010 by Joanna. Love the idea of a skull wearing a necklace. Have you been listening to “the history of the world in a hundred objects” on radio 4? Sounds like the mirror should be one of them. The mirror is really beautiful. It always amazes me that something so intricate and detailed could be made without the use of modern tools/technologies. Wouldn’t you love to know it’s story… If only these objects could talk. 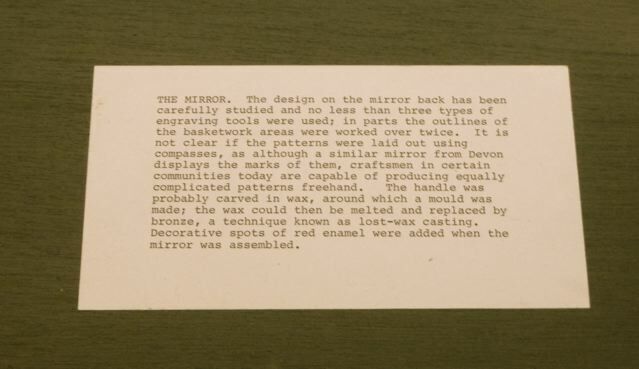 I’ll put a little more about the mirror in the post for you Dan! Robin, I wondered if you would comment on this one :) I missed the Bon Marche Head completely! But I’m back in Gloucester in approx five weeks from now so I will have a chance to see it then! I like that museum! Shame they don’t have postcards of the exhibits though!